After the two ads starring Troy Aikman and Joe Buck on FOX, on one of the network’s Thursday Night Football broadcasts, which also features the Philadelphia Eagles getting fired up for their game against the New York Giants, Tide has released two new ads also set on the pitch. One of them opens with Troy Aikman cutting to Erin Andrews, who’s about to interview Broncos legend Terrell Davis, who has one of the most memorable nicknames in football. 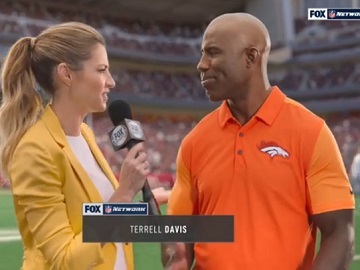 “TD, tell me what you think of this game we have,” she asks Davis, who starts to give an answer, but stops when he notices that his name on screen is changed from “Terrel Davis” to “Terrel ‘Tide Ad’ Davis”. Erin Andrews tries to ignore his lapse of concentration and asks him what he misses the most about his playing days. Unable to get over the way his name appears on screen, Terrel Davis can’t help but state his middle name is Lamar, while pointing towards the camera that holds inaccurate information about him. When his name is adjusted from “Terrel ‘Tide Ad’ Davis” to “Terrel ‘Lamar Tide Ad’ Davis”, he wants to know what’s going on, but a guy passing by greets him (using this entire name) and compliments him, which makes Davis thank him with a smile, delighted that he’s been praised for the way he looks. Finally, Erin decides to send it back to Troy Aikman, who adds “A true legend. Terrel Tide Ad Davis” while onscreen lines read “If it’s clean, it’s got to be Tide”. “Every Ad is a Tide Ad” tagline was introduced in the brand’s Super Bowl LII campaign, created by Saatchi & Saatchi New York and starring David Harbour. The Stranger Things actor stars in a series of four ads whose cost for the airtime in the Big Game added up to around $15 million.